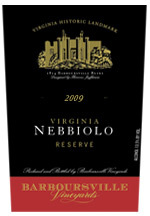 Virginia wine refers to wine made from grapes grown in the U.S. state of Virginia. Wine has been produced in the area since the early days of European colonization in the 17th century. 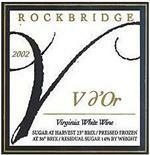 Virginia has hot humid summers that can be challenging to viticulture. Since 2000, Chardonnay has been the most produced grape variety, followed by Cabernet Sauvignon, Viognier, and Cabernet Franc. French hybrids and native American grape varieties account for nearly 20% of total wine grape production in the state. Wine experts still come to this estate in the conviction that Nebbiolo should not be grown outside of Piemonte, only to express disbelief that our Nebbiolo is grown and crafted right here. The king of Tuscan viticulture, gentle and elegant, with plenty of cherry and plum aromas that are well integrated with a lingering finish and a round structure. Refreshing and intriguing with vibrant fruit flavors leading to ripe pear, lingering on the finish. The moderate acidity integrates well with fine bubbles and a soft structure. House sparkling wine, The Inn at Little Washington. This balanced Merlot is shows complex flavors suggesting dark cherry and ripe plum. The supple tannins provide a smooth, long, lasting finish. A great companion to spicy pasta dishes, aged cheeses, grilled tuna steaks and pork....just to name a few. Combining a light, delicate palate weight with intense flavors of bright raspberry and cherry fruit, the Jefferson Vineyards Cabernet Franc is tempered by soft white pepper, cinnamon, and baking spices. 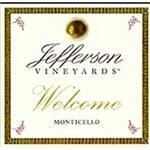 Combining a light, delicate palate weight with intense flavors of bright raspberry and cherry fruit, the Jefferson Vineyards Petit Verdot is tempered by soft white pepper, cinnamon, and baking spices. Classic Viognier aromas of honeysuckle, apricot and pineapple lead to similar flavors lifted by shimmering, polished acidity and an underlying minerality. This extraordinary cuvee will age gracefully for the next 1 to 2 years. 33% Cabernet Sauvignon, 30% Merlot, 17% Malbec, 10% Cabernet Franc, 10% Petit Verdot. Cherry, currant, and herbaceous flavors. Balanced tannins with a lingering finish. Full-bodied and complex. Limited production. Raspberry and strawberry aromas with rich layers of flavor. 40% aged in new oak barrels. Medium-bodied and soft earthy overtones. Explosive tropical fruit flavors: Pineapple and peach with hints of grapefruit. Powerful, yet feminine. Sweet and ripe on the palate with peach, apricot, pineapple, and mango notes. Long and flavorful finish. 2012 Vintage is a gorgeous, bold wine. Gorgeousness and generously made flesh. Aromas of jam, vanilla, and exotic wood. On the palate the tannins are chewy, rich, and tight, promising to unwind with age. 2013 Vintage is a gorgeous, bold wine. Gorgeousness and generously made flesh. Aromas of jam, vanilla, and exotic wood. On the palate the tannins are chewy, rich, and tight, promising to unwind with age. The classic wine of Germany, Riesling is one of my favorite varietals. 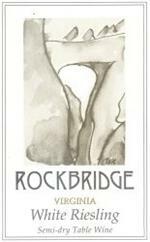 The 2011 Riesling is a softer wine than typical from Rockbridge Vineyard as the vintage was warm and yielded low acid wines. This is a signature "ice wine" made from late-harvest Vidal Blanc. It has an intense mandarin orange/honey fruit with a rich sweet and balanced palate. Simply superb! A wine tasting custom designed to meet your specifications. Whatever the event, a wedding, a rehearsal dinner, or a special occasion. Please contact us to research and design a custom wine tasting evening for you and your family and friends.